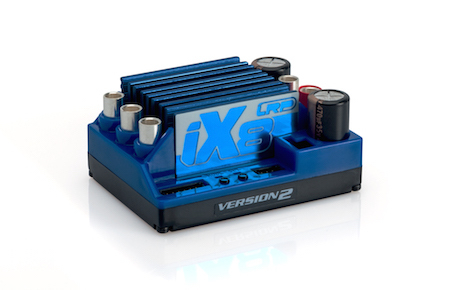 The internationally very successful LRP iX8 brushless competition speed control gets a worthy successor: the LRP iX8 Version 2 features a new hardware and is already equipped with the latest v2.6 team firmware as standard. The speed control generates significantly less heat and its performance in racing is extremely consistent on the highest level. Aggressive Initial Drive settings and the 1/8 BR2 brake – completely developed from scratch – will help you to leave your competitors behind. The integrated Intelligent Brake/Reverse v1.0 algorithm guarantees huge driving fun also off the tracks. USB Software Updateability - Benefit from all the latest performance improvements and updates.